Stephanie is a Youth Services Librarian. 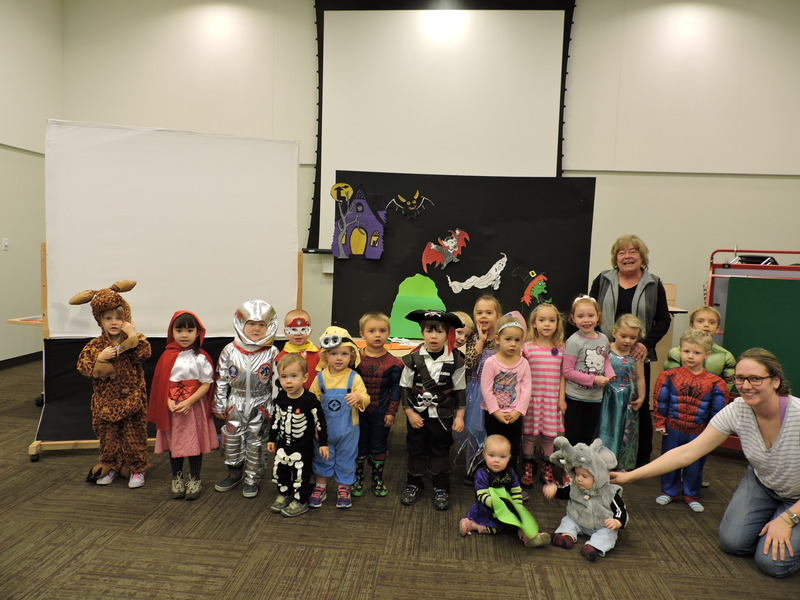 If you would like to receive a seasonal newsletter that outlines upcoming events for kids at the library in Vernon you can e-mail svollick@orl.bc.ca and request to be added to the list. You will only be contacted 4-5 times a year with an overview of library programs. Please provide your name, e-mail address and the ages of your children (to help us provide the most relevant info). For the most up to date schedule of events and access to online registration you can visit the library’s calendar. We had a fabulous tea party with young ladies and gentleman for Winter Carnival. Miss Frizzle and Fancy Nancy were very excited to represent the library in the Winter Carnival Parade. Thanks to everyone who made family literacy week so fun! Including Mika who filled in for the Dr. Seuss event when I lost my voice. We had stuffed animals sleep over at the library last night. They had lots of fun! The winner of the Reluctant Dragon Contest is Thea! She received 2 tickets from the Performing Arts Centre to their Reluctant Dragon show next week. 2nd place winner Annika age 11 who will also receive a ticket to the show thanks to Fairview Family Law. pile of coins jewels and gold, the journey there was very cold. The dragon was Smaug, out of the fog. tunneling through a sea of his treasure. There is a key to this place, after you find it you must race! For the last day of fall, the keyhole will call, and appear! the silent sounds of a dragon stalking underground. In treasure he will lie, at night he will fly, off for a bite. Smaug’s wings in rhythm of one, his hunting has begun. Beware if you see him with one glance, you will note you haven’t a chance. So Mr. Bilbo Baggins, snuck to the dragon’s. Along with his twelve friends. They were near the end. to defeat the dragon but take his treasure in what? A wagon? One ring glittering light, in the middle of the night. with Bilbo trying to be brave. flies to a town in his anger. All townsfolk are in danger! Behold, the power of Smaug! Vernon Vipers @ The Library! The hockey players and their coach were kind enough to spend time at the library today. It was a small crowd due to the weather but the kids who were there really enjoyed meeting the players. Thank you Vipers! We have a full week of events for families this year. We will start with Dear Zoo Puppet Show Jan 23 10:30am. This will be a special story time featuring both Stephanie and Judy and their puppet pets. Next is the Dr. Seuss Puppet Show Jan 27 3:30pm (please register). With shadow puppets, a glow in the dark story and a cat in the hat activity. Olivia The Pig Party an 28 3:30pm (please register) we will see Olivia take over the circus, train her cat and remind us how fabulous a pig can be. Mo Willems Puppet Show Jan 29 3:30pm (please register) We will be repeating the event from last year’s Summer Reading Club including black light, felt story and elephant and piggie classics. With the addition of I Really Like Slop the skit and puppet show. We will conclude the week with a Stuffie Sleepover Jan 29-30th . Drop off your teddy bear or stuffed animal and we will take good care of them at the library. They’ll have lots of fun with our puppets and books and tell you all about it when you come to get them in the morning. Attending any of these events enters you in the draw to win a prize pack of unplugged activities for kids put together by the Optimist Club or books donated by Friends of the Library. Some of the cuties who attended our Halloween Special Today.